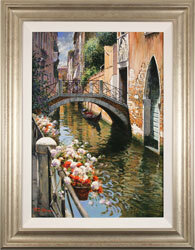 York Fine Arts offers high quality delivery and shipping for all artworks throughout the UK and worldwide. Shipping costs are calculated on the size and weight of the artworks and your destination address. To calculate the shipping costs to your country please either do so online through our shopping basket or telephone the gallery on 01904 634221. Shipping times vary depending on the size of the artwork and on your destination address. Upon the confirmation of your purchase we will contact you with an exact arrival day and tracker IDs to watch the progress of the delivery. For further information, please telephone either our York gallery on 01904 634221 or our Harrogate gallery on 01423 561228.